Mixers moved the puppies! Yesterday, she had them under my van. I guess it was cooler under there than in the doghouse. Then, she moved them under David's truck, because Shelby flooded the driveway. Now they are just gone! I know she is taking good care of them, but I'm sad because I wanted to watch them every day. She's bring them back, but probably not until they have their eyes open. I worry about predators, especially when she comes back to the house to feed and Mix doesn't have her eyes on them. I might have to do some tracking of my own today and try to find them! 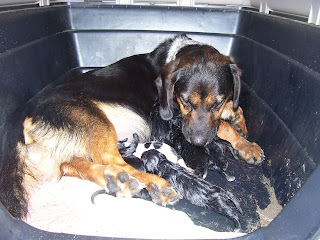 Mixers, our country hound-dog, gave birth this morning to several fiesty and cute puppies. I felt like she was going to have them last night, and I checked on her several times before going to bed. When I got up this morning, I went out and called Mix, but she didn't come. Shelby got up a little later, and went out to check on her. It was so funny, he came screaming in the house, "We have puppies! Mixers had her puppies!" So I went outside and sure enough, there were four little ones. We watched as she delivered two more, then came back inside. This afternoon, we went out to discover that she had given birth to two more puppies, but sadly, one didn't make it. There are six mostly black ones and a white one with three spots in a row down his back. Mixers is a good mama. I picked up one puppy to look at it. She gently licked it then ever so tenderly grasped it with her mouth and took it from me. She has let them nurse. The seven little ones all seem to be doing well, and Mix seems to be very satisfied as a new mom. Mix is a beagle/basset mix, and she mated with a stray (a medium sized dog that looked to be part Lab - these pups ought to be some combination!!!) that wandered up in the yard. We put off having her spayed because we figured, wrongly, that since she's been with us for two years now that she was probably already spayed. After she's weaned these puppies, she will be taking a trip to the vet! UPDATE: There are now eight living puppies! This shows you what a sport Jeremy can be! He's such a determined kid. We went shopping after our Scout activity Saturday morning, and the boys put in for some gum. WELL...Jeremy was just bound and determined that he was going to blow a bubble. He knew that I had been playing around with the camera, so every time he tried it, Jeremy would come in and say he was ready for a picture. Then, I'd snap a photo and the bubble either didn't blow, or it popped, or something. Jeremy would go back and say, "I gotta go practice!" He FINALLY came tearing down the hall saying, in a garbled voice, "Pictull! Pictull!" I grabbed the camera, turned around, and there he was with his shirt off and a huge bubble in front of his nose! Jeremy was soooo happy that he could finally do it! You will all enjoy this video. Check it out! Hi everyone...well, as you can see, I finally bought some decent camera batteries! YEEHOO! I downloaded some fantastic software from Google called Picasa2, and I think it is going to work great to share my pictures. I've had my camera for almost two years, and the software that came with the camera won't let me easily share my pics. Anyway, as you can see I went and did a little shopping today. I picked up this cute baby-blue dress for Kaelie in a 9-month size. It says "Little Princess" across the front. 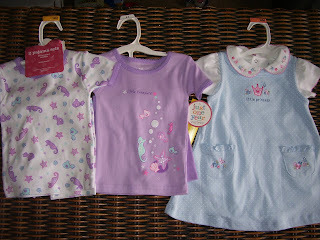 The pajama sets came together, and the lavender one says "Little Treasure" across the front. I'm not planning to buy a lot of clothes until we get our referral, but a little retail therapy every once and a while doesn't hurt! I picked these up at Target, so they were pretty much in my budget. I'll post some pictures of the boys and Kaelie's room later, I just wanted to see how the camera and the new software would work out. My friend Julie called me Tuesday afternoon and asked me if I wanted some peas. I said sure, so I went over to her house and she gave me probably 2, maybe closer to 3, bushels of brown crowder peas with some purple hulls mixed in. I shelled a big dishpan full, and put them up in the freezer yesterday morning. Boy, they sure are going to be good seasoned with some ham or bacon. I think I'm going to fix a ham for supper one day next week. When I was a kid, we put up peas every year. I remember sitting in the floor and having to help shell. Butterbeans were the worst! Do you like peas? Have you ever put up any fresh ones in the freezer? It's not so hard, just time-consuming....a good thing when you are waiting like crazy! Tonight is our last night of VBS. It has gone very very well - I think the kids have had a great time. I've enjoyed getting to know my partner teacher. I never thought she would have the sense of humor that she does! We've all laughed and learned the truth about Jesus together this week! Hi - thought I'd try to answer that age-old question tonight! When can we expect our referral? There is a site called China Adoption Forecast that has predicted that we will see our referral on January 25, 2008. The Rumor Queen put a chart on her site today that breaks it down by the number of days that the CCAA may refer every month. According to RQ, the 12-month average for number of days referred is 12. The last three referral batches have been incredibly small, but I hope that they will get through a few more days in the next few months. It could be this time next year before we travel...it would be nice to be in and out of China before the Summer Olympics. OK, I'm going to admit it, and see if ya'll can help me out. Jeremy has 3 warts. He has one on his knee - it's come back after we went to the dermatologist to have it frozen off. Since then, he's developed two more, one on his index finger and one on his thumb. We are treating these with Compound W, but nothing seems to be happening. Any suggestions? Our new I171-H arrived today! I was so excited! The approval date is June 11, 2007, which means it will expire on December 11, 2008 (this is good for 18 months). Our fingerprints were taken on June 5, 2007, and those will expire on September 5, 2008 (fingerprints expire after 15 months). What is this for, anyway? The I171-H, sometimes known as an I797, is basically approved from the Department of Homeland Security saying that they are approving you to adopt and they will issue an immigrant visa on behalf of your child once an adoption is completed. The immigrant visa is basically the U.S. government giving permission for the adopted child to legally enter the United States. The Citizenship and Immigration Service (CIS, which used to be known as INS), requires adoptive families to turn in a completed homestudy (in our case, a homestudy update), birth certificates, marriage license, and if applicable, divorce decrees. You have to go to the nearest CIS office (in our case, Atlanta), and be fingerprinted. This is a very interesting process. When we adopted Shelby and Jeremy, they did it the old-fashioned way, with an inked pad and a blue and white card. Now, your fingerprints are scanned on a computer screen, sent to the FBI, and from what I understand, clear the FBI in 24-48 hours. SOOO, getting the I171H is a very important step in the adoption process, and one more hurdle leaped, so we can say that we are one step closer to Kaelie. I've tried my best to add a little music to my blog. Well, I hope it works! These are some of my favorite adoption-related tunes. I hope you don't have to wait for the music to download second-by-second. I've gotten frustrated with it, so I might have to give it up for tonight and work on it tomorrow. David will finish up a week's vacation today, and head back to work tomorrow. He has really gotten a chance to rest and relax this week. It's been nice having him around the house! He has a few challenges in the coming weeks: his store is going to be renamed from Southern Family Markets to Piggly Wiggly. I think David is looking forward to this as he is hoping it will increase his volume. Piggly Wiggly has some name recognition, whereas who has ever heard of a Southern Family Markets? We will be having VBS at our church next week. I will be the helper for the third/fourth grade class. I imagine I will have a pretty busy Monday putting the finishing touches on our classroom and getting our teaching materials ready. The first day of VBS is usually chaotic! But, it is well worth it in the end! That is all I can possibly say after a whirlwind week at Cub Scout Day Camp. I served as Den Leader to....I guess it was about 10 boys in a Wolf Den (rising first graders). We had a blast! The Wolves (and a couple of Tigers in the mix) earned their belt loops for swimming and culture. Most of the guys in my den earned their Safe Shooting Patch for BB's. They had to shoot a score of 35 on a paper target posted 15 feet away. Many of the boys had never canoed, or shot a bb gun, or a bow and arrow...all the boys matured during the week and made new friends. I think this was Shelby's favorite day camp so far. He made a new friend from a neighboring pack. The pack was organized to help keep the Webelos separated from the "younger guys" as much as possible, and I think that Shelby enjoyed being with the older kids. The Webelos earned their Naturalist and Scientist activity badges during the week. Now, all I have to do is rest and try to recover from hiking all over camp for a whole week in the heat and humidity! David, Shelby, Jeremy, and I went to Atlanta today for our fingerprinting appointment. We are in the process of completing our paperwork for a new immigration approval (I171H). This form is required to show that you meet eligilibity requirements set forth by the Department of Homeland Security. This document basically shows that the CIS will give your child an immigration visa to the United States after the adoption is complete. Our first (original) I171H for Kaelie's adoption expires on June 13. It was a rather uneventful day. We waited longer than expected, but we had a chance to meet a China Peaches family that was also there completing their fingerprints. The boys were very well-behaved. Hopefully, if our prints go through (they always have in the past), we will have our new document by the end of June. The immigration approval is good for 18 months.